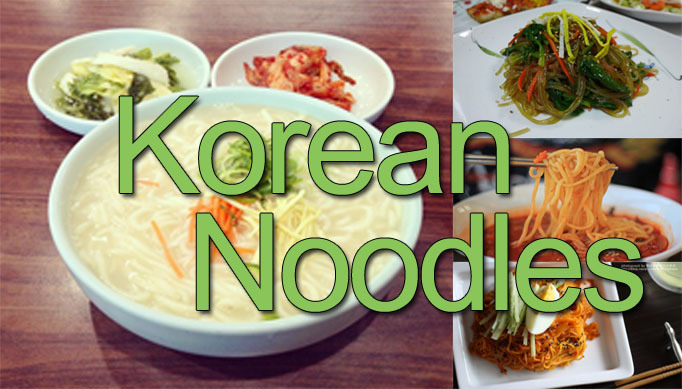 If you hadn’t noticed yet, Koreans love rice and noodles. Finding a dish without either of two key components is like finding a Korean restaurant without kimchi. Yes that’s a lot of carbs for sure, but the country houses some tasty dishes for a wide variety of palates. Feeling the summer heat? Sick of having red skin from scratching all those mosquito bites that form a painting on your body? 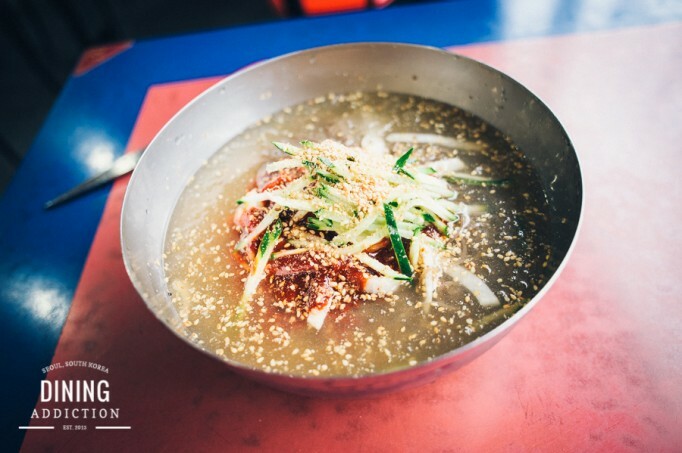 Grab some pants and enjoy a bowl of refreshing (물냉면) mool naengmyun, which is cold buckwheat noodles. All right, it won’t alleviate mosquito bites but hey 1 out of 2 isn’t bad right? This seasonal dish is extremely popular in the summer as a meal or husik (후식 – an after meal). 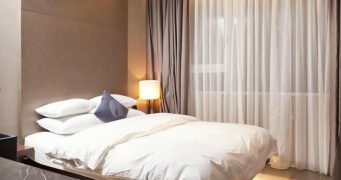 Try some patbingsoo (팥빙수 – shaved ice dessert) afterwards to fight back against that awful humidity and heat. 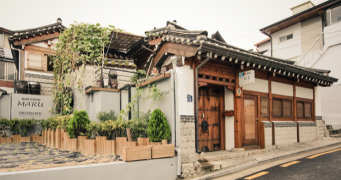 Check this out if you’re looking for the best Naengmyeon Restaurants in Seoul. An alternative to those of you who don’t like your noodles swimming in soup is kimchi-bibim-gooksu (김치비빔국수). Guksu refers to noodles, so keep that in mind. This dish consists of a bowl of noodles typically topped with cucumbers and other assorted chopped vegetables with a hearty dose of spicy seasoning to top it off (no soup or broth). If you prefer rice, opt for the extremely popular bibimbap instead to satiate your cravings. 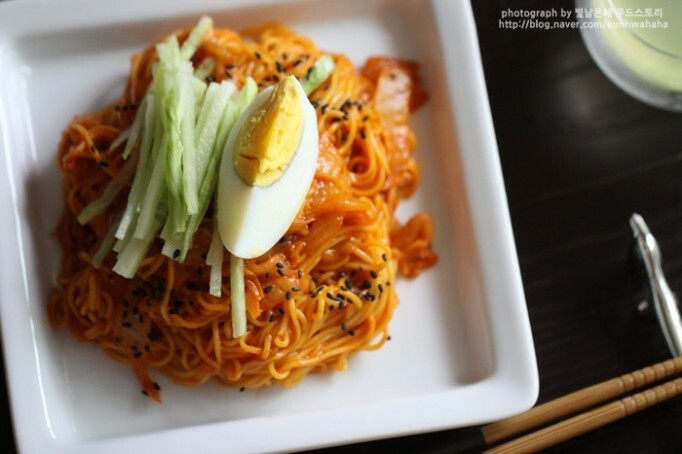 Kimchimari guksu (김치마리 국수) is yet another noodle dish that you will come across in restaurants. 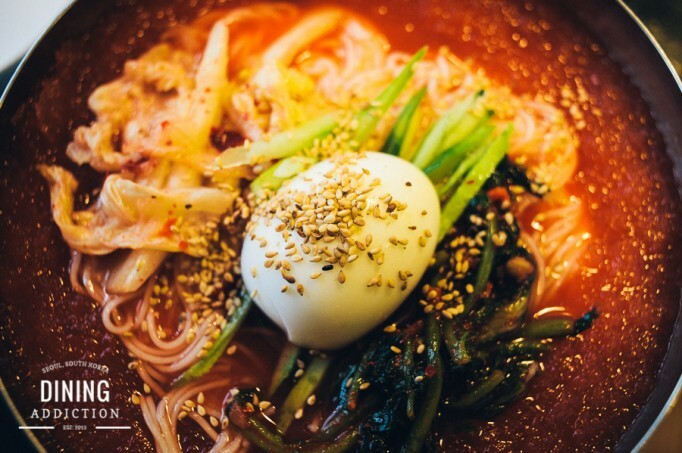 This dish includes the cool icy soup that comes with noodles, but packs a different kind of punch than naengmyeon as it often contains a more reddish soup thanks to the variety of kimchi that inhabits the bowl. Often, seaweed and cucumbers are also included with the noodles. As the summer season is upon us, try out this dish for a cool and slightly spicy aftertaste that is perfect as a lighter meal. 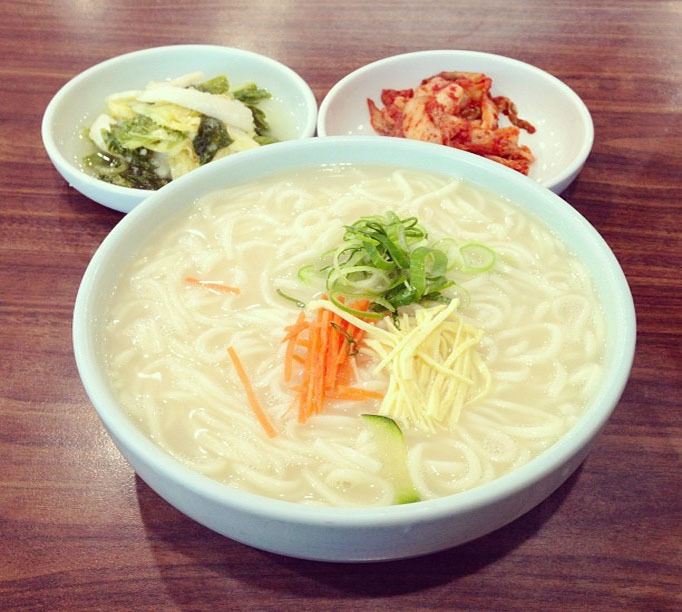 Another extremely popular and delicious dish is (칼국수) kalgooksu, which translated literally means knife-cut noodles. They are made out of flour and typically come in a pleasant broth that makes an ideal meal. Sure beats the hell out of a kimbab that’s for sure. Toss in some chicken and you got a bomb dinner for a mere few thousand. Got to love how cheap Korean dishes are; makes it easy for people who are deathly afraid of the kitchen. See why you should eat this on a rainy day! 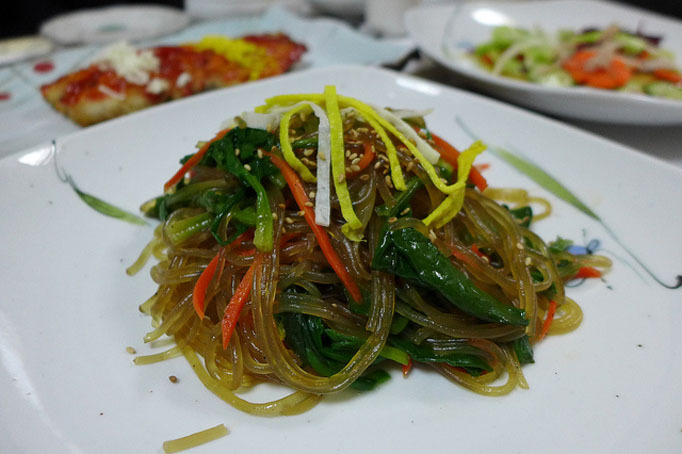 Japchae (잡채) is the one side dish that is on this list. So if you eat at a joint that serves it, enjoy it to your heart’s content (remember: free side refills!). This delicious concoction is made of glass noodles with bits of vegetables cut and added like so. Also thrown into the party are pieces of bulgogi (fire beef, if you hadn’t noticed many Korean words translated sound rather comical) spinach, and mushrooms doused with soy sauce and sesame oil for a little more kick. I really love this article because I’m a noodles and pasta lover. Almost everyday I eat noodles (in breakfast, lunch or dinner time). 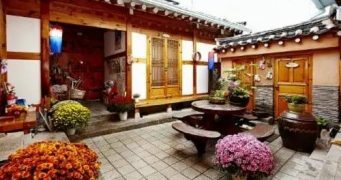 Anyway, I wanna say many thanks for your articles, think that I’ve learned so many things about Korea in here. 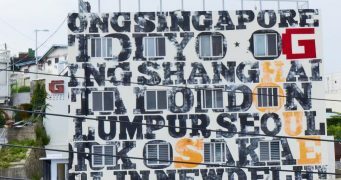 Hopely someday I could visit your lovely country..